Annapurna or Annapoorna is the Hindu Goddess of nourishment. Anna means food and grains. Purna means full, complete and perfect. She is a form of Parvati, the consort of Shiva. Once Goddess Parvati was told by her consort Shiva that the world is an illusion and that food is a part of this illusion called maya. The Divine Mother who is worshipped as the manifestation of all material things, including food, became angry. To demonstrate the importance of her manifestation of all that is material she disappeared from the world. Her disappearance brought time to a standstill and the earth became barren. There was no food to be found anywhere and all the beings suffered from the pangs of hunger. Seeing all the suffering, Mother Parvati was filled with compassion and reappeared in Kasi and set up a Kitchen. Hearing about her return, Shiva ran to her and presented his bowl in alms saying, "Now I realise that the material world, like the spirit, cannot be dismissed as an illusion." 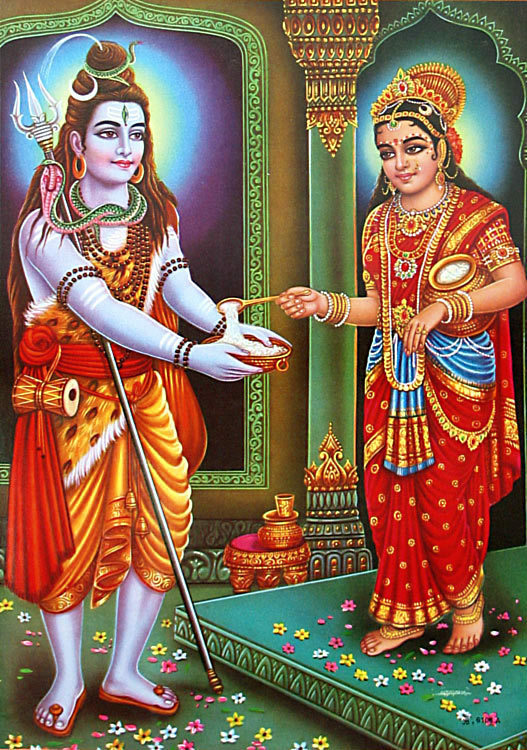 Parvati smiled and fed Shiva with her own hands. Since then Parvati is worshipped as Annapurna, the Goddess of Nourishment. Physically, Annapurna is described as holding a golden ladle adorned with various kinds of jewels in her right hand and a vessel full of delicious porridge in her left. She is seated on a throne. In some depictions, Lord Shiva is shown standing to her right with a begging bowl, begging her for alms. It is said that she does not eat a morsel unless all her devotees have been fed in her temple. “Oh Annapurna, who is always full, complete, and perfect. Beloved energy of Lord Shiva, for the attainment of perfection in wisdom and renunciation, give me alms, Parvati. The Annapurna Vrat Katha containing stories of her devotees are also recited by her devotees. The most well-known temple dedicated to Goddess Annapurna is in Varanasi, U.P., India. Adjacent to the Sanctum of the Goddess is the Kasi Viswanath temple. The two are separated by only a few yards. Annapurna is regarded as the queen of Varanasi alongside her husband Vishweshwar (Shiva), the King of Varanasi. In the temple, at noon time, food offerings to the Goddess are distributed to the elderly and disabled daily. During the Autumn Navaratri food is distributed on a larger scale. The other famous temple is Annapoorneshwari Temple, situated at Horanadu in the Western Ghats of Karnataka, where evening prayers are held after the devotees are fed. Another famous temple of the goddess is situated in Cherukunnu, Kannur, Kerala.